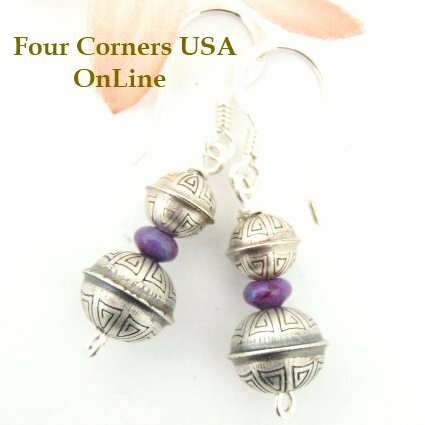 Purple Turquoise is the 'new' Mohave Turquoise which is not all that new and just like Mohave Green Turquoise not a natural color, but a brilliant addition to Jewelry Making specifically for American South West jewelry designs as seen in these Earrings showcasing Purple Mohave Turquoise and Navajo made Silver Beads. 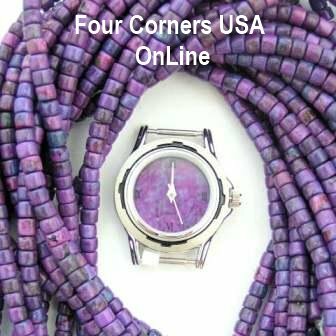 In the case of Mohave Purple Turquoise and Mohave Green Turquoise, they are actually a cut of Arizona Kingman Turquoise that have been dyed these colors and specifically with the Purple as in our Stone Watch Faces you can see some blue popping through. 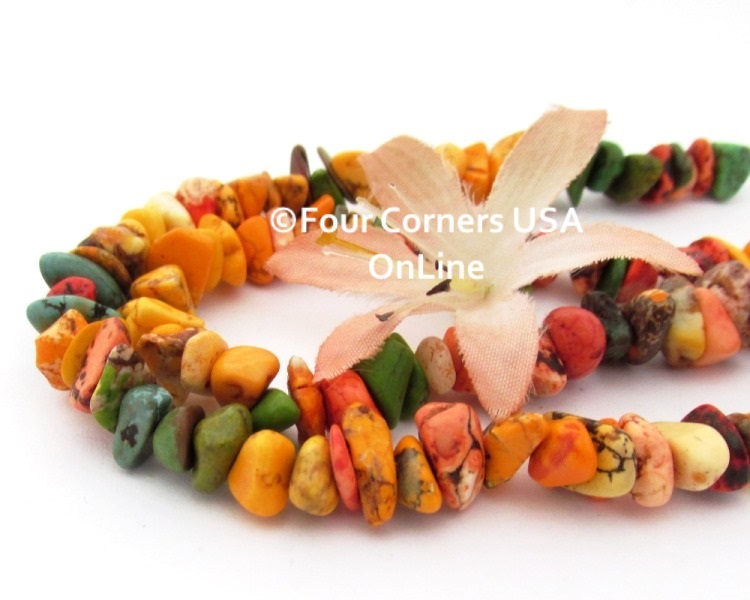 But many 'Purple Turquoise' Beads, Cabochons and Jewelry products are really 'dyed' Magnesite just as Magnesite is often dyed a Turquoise Color. Purple is the color that evokes Passion. Recently we have had several inquiries regarding Purple Turquoise (sometimes referred to as Magenta Turquoise). At first I could not figure out the sudden interest because it has been around for years yet my conversations yield the impression of a new and exciting treasure. The inquiries became reminiscent of Mohave Green Turquoise when first introduced some 15 years ago (oh my, has it been that long ago?). We had quite a number of show attendees ask us about Mohave Turquoise. When Mohave Green Turquoise was first introduced, the Mohave Purple was not yet on the market so 'green' was not really used to describe or differentiate the products. I explained what 'Mohave Turquoise' was but they were insistent the product they were looking was 'natural' in color. Their excitement was overwhelming and with the description I began to think we were speaking of the coveted lime green Carico Lake Turquoise. So I brought them to our display (limited but exquisite) of brilliant lime green Carico Lake and much to my surprise, they indicated that was not what they were speaking of either. Slowly I realized these customers were indeed asking about Mohave 'Green' Turquoise and somewhere along the way came under the impression it was a 'natural new Turquoise find'. Purple Turquoise is the 'new' Mohave Turquoise which is not all that new and just like Mohave Green Turquoise not a natural color, but a brilliant addition to Jewelry Making specifically for American Southwest jewelry designs. 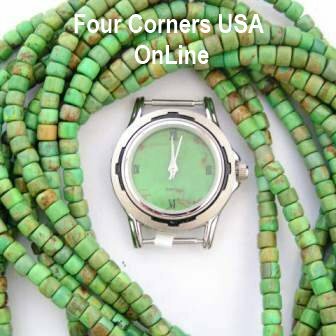 Our Mohave Purple and Mohave Green Turquoise Beads as well as our Stone Watch Faces for Men and Women are a specific cut of American Kingman Turquoise stone, permanently dyed and stabilized for durability (an acceptable and necessary process for enhancing the hardness of Turquoise for Jewelry Making). Stabilization and dying are entirely two different processes. With American Turquoise mines being depleted, I thought this was a 'win-win' in utilizing Kingman Turquoise rough and by-product from Bead making (lots of waste in creating beads) and also providing a less expensive alternative to lime green Gaspeite and deep purple Sugilite which are such beloved colors in Native American and Southwestern Jewelry complimenting the Blue Turquoise. If you follow the Jewelry Making market, I am confident you have seen 'new products' introduced (on a large scale at the International Shows) and trickling down to more localized shows throughout the year. Well, Purple Turquoise is one of the more recent inductees of 'Hot New Products'. 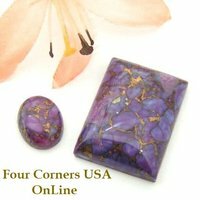 The new Purple Turquoise (we are discussing) offers a metallic veining often gold but I have also seen copper and is available in a variety of jewelry making products such as beads and cabochons. l would add the metallic veining is Mohave Purple Turquoise 'with a twist' but the gold veining was first introduced during the mid 2000's in an opaque Quartz we know commonly as 'Snow Quartz'. The beads were elegant with gold against white and quickly became very popular. I absolutely love the colors of both Mohave Green and Mohave Purple Turquoise and truly do believe it was a brilliant idea brought to the table so many years ago. My only disappointment is when 'New' circulates sometimes reality gets lost in the translation. Purple Turquoise is not a naturally mined mineral. With images shown previously of real America Kingman Turquoise having been dyed very specific colors to include in Southwest Jewelry Design, here is a comparative example of chunky, veiny Magnesite that has been dyed multiple colors (beautifully I might add) for use in spirited jewelry truly capturing the Southwest spicy essence. Although this strand showcases Greens, Yellows, Oranges, Blues and soft corals, it does not include purple but the concept is the same. All these beautiful colors are dyed into this base creamy white magnesite stone and then treated to highlight the already natural veining. 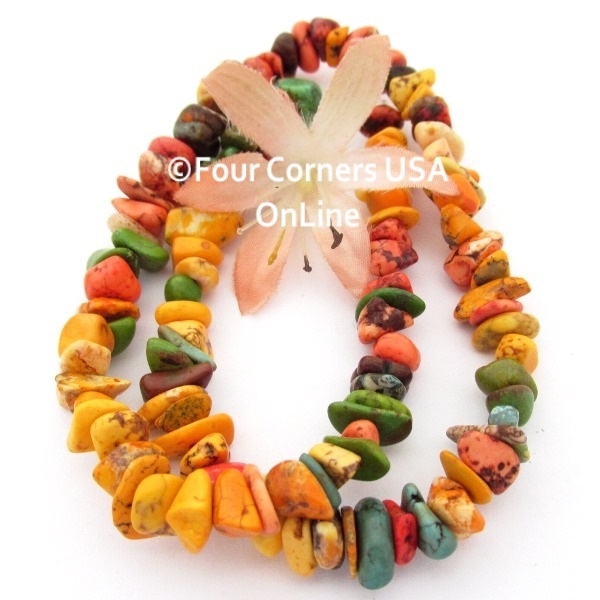 When it comes to Greens and Blues these dyed beads can be difficult to differentiate real turquoise from dyed turquoise to an untrained or inexperienced eye but rest assured no one can mistake that the Yellow Dyed Magnesite is NOT 'natural Yellow Turquoise'.